Prior to crowdSPRING, I was a lawyer for 13 years – focusing on complex commercial and intellectual property litigation. This is the first in what will be a regular feature in our blog discussing important legal issues that impact every small business. Copyright is a form of legal protection provided to those who create original works. Under the 1976 Copyright Act (United States), the copyright owner has the exclusive right to reproduce, adapt, distribute, publicly perform and publicly display the work. Any or all of these rights can be licensed, sold or donated to another party. One does not need to register a work with the U.S. Copyright Office for it to be automatically protected by copyright law (registration does have benefits – but we won’t be covering those in this article). Copyright laws around the world can differ in significant ways. Most countries are signatories to various International treaties and agreements governing copyright protection (such as the Berne Copyright Convention). Under the Berne Copyright Convention, if your work is protected by copyright in your own country, then your work is protected by copyright in every other country that signed the Berne Copyright Convention. Copyright protects works such as poetry, movies, writing, music, video games, videos, plays, paintings, sheet music, recorded music performances, novels, software code, sculptures, photographs, choreography, and architectural designs. To be protected by copyright, a work must be “fixed in a tangible medium of expression.” This means that the work must exist in physical form for at least some period of time. A tangible medium includes paper (even a napkin will do!) and digital forms of storage. Additionally, the work must be original. It doesn’t matter if the work is similar to existing works, and copyright law is blind to whether the work is good or bad – so long as the work is original, it is protected by copyright. Finally, a work must be the result of at least some creative effort by the author. Copyright doesn’t protect an idea, system or process (you would need to obtain patent protection for those). So, for example, if your small business is creating software programs, you would generally be unable to protect under copyright law the algorithms, methods, systems, ideas or functions of software (your code, however, is protected – nobody can sell or distribute your code without your permission). For works created after January 1, 1978, copyright protection lasts for the life of the author plus an additional 70 years. For an anonymous work or a work made for hire (we’ll talk about that in a later post), the copyright lasts for 95 years from the year of its first publication or a term of 120 years from the year of its creation, whichever expires first. For works first published prior to 1978, the term will vary depending on a number of factors. What Should Small Businesses Do To Avoid Violating Copyright Law? 1. Don’t copy material just because you don’t see a copyright symbol. 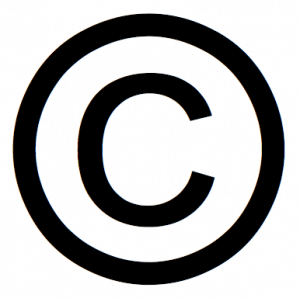 Since 1978, U.S. copyright law has not required that the copyright owner post a copyright notice with their work. That means that any work reduced to a tangible form (paper or digital, for example), is automatically protected by copyright. 2. Respect Creative Commons licenses. Creative Commons is a powerful framework that works alongside copyright law, but don’t confuse Creative Commons with “free for the taking.” There are a number of different types of Creative Commons licenses and you should review the specific license before you use something protected by Creative Commons. For example, when searching for images on Flickr to include in my blog posts, I always search for images licensed under Creative Commons and available for commercial use. 3. Don’t use works created by someone else merely because you can’t find any copyright restrictions or the author’s identity. Merely because you don’t know who created a work doesn’t give you the right to use that work. This is commonly abused when people do a search – on Google, for example – for images and use an image they’ve found in an article, blog post, or logo design. 4. Define Copyright Ownership. When you hire independent contractors to create work for you – such as a custom logo design – consider including “work-for-hire” provisions in your legal agreement with your independent contractor (more about this in a later post) or provisions that transfer the ownership of the work created by those contractors – or at the very least, a license to use – to you and/or your company. 5. Understand the Permitted and Prohibited Uses Under a Copyright License. When you buy or use stock photos or other materials protected by copyright in your marketing materials, advertising, or as part of your web design, pay attention to what you are and are not permitted to do with that work. For example, stock photos from sites like iStockphoto and Shutterstock are protected by specific licenses which restrict the uses for those photos and prohibit, among other things, use of stock for logo design. Don’t assume that a license gives you unlimited rights – it most likely does not. In a later post, we’ll talk about more advanced copyright issues, including what to do if someone violates your copyright. And If there are other small business legal issues you’re interested in reading about, please leave a comment and let me know. Please remember that legal information is not the same as legal advice. This post may not address all relevant business or legal issues that are unique to your situation and you should always seek legal advice from a licensed attorney.